SpongeBob SquarePants and Philosophy is designed to introduce fans of SpongeBob SquarePants to some of the great thinkers and questions in philosophy. The essays can be shared by young and old alike, kindling new interest in philosophy and life's big questions. What keeps SpongeBob "reeling in" major audiences on a daily basis is that underneath the lighthearted and whimsical exterior are the seeds of long-standing and important philosophical discussions about identity and the self, our obligations toward others, benefits and tensions of the individual in community, principles of the marketplace and environmental ethics, and questions of just how exactly Jack Kahuna Laguna can build a fire at the bottom of the ocean. (Okay, so perhaps we don't have an answer for that last one, but maybe if you look into that fire long enough the answer will be revealed.) The book begins with a section exploration of the major characters of the series. To begin, Nicole Pramik uses the philosophies of Aristotle to demonstrate why SpongeBob, more than any other character in the series, is defined by a life of well-being and flourishing. In chapter two, Timothy Dunn provides an assessment of SpongeBob's best friend, Patrick Star, using the writings of J.S. Mill to ask if the life of simple pleasures preferable to the life of the mind, while in chapter three Natasha Liebig uses the German pessimist philosophers to reveal what it means to live the life of Squidward Q. Tentacles. Chapter four uses the competing philosophies of Ayn Rand and Karl Marx to evaluate the actions of SpongeBob's boss, Mr. Eugene Krabs, while in chapter five Denise Du Vernay explains how Sandy Cheeks offers a brand of feminism that breaks down traditional assumptions about masculine and feminine identity and repackages them into constructive and empowering messages for young people. Concluding this section of the book, Nicholas Michaud uses the philosophy of Friedrich Nietzsche to ask us reconsider our belief that SpongeBob and his friends are somehow heroic by giving us insight into the "will to power" held by the powerful little protozoan, Plankton. Section two of the book is dedicated to exploring the community of Bikini Bottom, starting with Shaun Young's examination of Bikini Bottom as a representation of various theories of the just state. 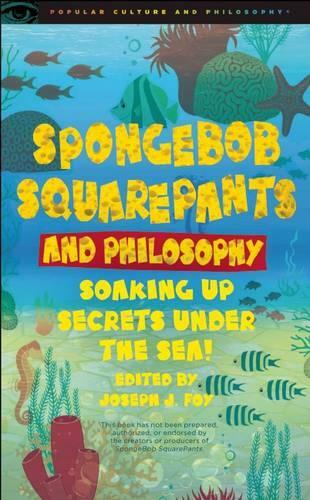 In chapter eight, Nathan Zook looks into whether we might learn something about theories of democracy and political participation from an election between SpongeBob and Squidward for "Royal Krabby," while in chapter nine Adam Barkman uses the writings of Dante Alighieri to assess the monarchal rule of King Neptune. Chapter ten uses the legal philosophies of thinkers like Thomas Hobbes, John Locke, John Rawls, and David Hume to answer whether Mr. Krabs has the proper philosophical basis upon which to claim an individual right to possess and profit from the secret Krabby Patty formula. Chapter eleven then takes us to the pristine Jellyfish Fields where Greg Ahrenhoerster uses literary naturalism and the works of transcendentalist thinkers to examine environmental ethics and an individual's obligations to shared resources. The third and final section uses SpongeBob to explore psychological and scientific questions that float around under the sea. In chapter twelve, Katie Anderson uses the episode "Sleepy Time" to explore Cartesian principles related to the philosophical questions that attempt to distinguish between dreams and reality, and in chapter thirteen Robert Kincaid continues the examination into philosophical issues related to the mind by using SpongeBob, Squidward, and Patrick to relate the theories of Sigmund Freud. Chapter fourteen is dedicated to an introduction into the philosophy of science by Wilson Gonzalez-Espada, and Robert Vuckovich concludes the volume with an essay on SpongeBob's insatiable thirst for knowledge in the episode "The Secret Box."